With employee turnover pushing 30% with no end in sight, the stakes in the talent war keep getting higher. That’s why this retention strategy is pure platinum! Remember when your organization had dozens of job applicants for each opening, and people were applying for openings that didn’t even exist? Just three years ago the lack of job opportunities and economic growth meant that employers could always find talented people. Each month seems like a new record low in unemployment. 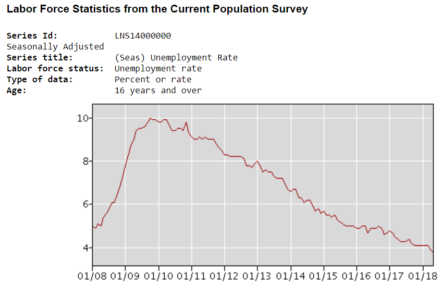 Look at the latest US Department of Labor graph showing unemployment over the past 10 years. It was just a few years ago and the average job posting drew more than 20 applications. Today it is less than ONE! Does this describe your organization? More importantly, what can your organization do to grow and retain talent in order to keep your key positions filled? My company and I recently completed the second of two significant employee engagement studies, one in healthcare and the other in technology services. Both studies were completed in response to our clients wanting to better understand how to reduce turnover and retain talented staff in key roles. Several hundred employees were surveyed and more than 10,000 interview questions were asked and answered. The employee demographics involved were 13% Gen Z, 73% Millennial, and 14% Gen X. The studies investigated five specific areas: employee satisfaction, manager satisfaction, cultural satisfaction, organizational satisfaction, and positional fit. Unsurprisingly, each of the studies tended to validate the other in terms of the findings and both studies were consistent with other engagement studies conducted over the past two years. Each of the studies resulted in the identification of high impact solutions that any employer can implement to reduce the voluntary turnover they are experiencing. Most employers accept employee turnover as a cost of doing business. That mindset is okay when you’re hiring the right people and voluntary turnover is under 10%. Otherwise, most of today’s enterprises are suffering excessive turnover. The 2018 JobSeeker Nation Study reports that 82% of the US workforce is now actively or passively looking to change employment. It’s no wonder that Forbes Magazine ran an article a few months back that said employee turnover is at its highest rate in a decade. I predict that it will be in excess of 30% for the next few years, which will be up 50% from historic norms. SHRM says the cost to replace a good employee runs between six and nine months’ annual compensation for the position. Forbes, Wall Street Journal, and others routinely cite the cost of the wrong hire at two to three times the annual compensation for the job. In addition, most of the workforce is not engaged at work. Gallup, for instance, says that just 29% of Millennials and Gen Z are engaged, and those two generations make up more than 40% of today’s workforce (and rising fast), according to Pew Research. The Engagement Institute pegs the annual disengagement cost at more the $500,000,000,000 (that’s a half-trillion dollars). To combat this, some employers invest significantly in unusual workplace perks, such as Free Food Fridays, exotic company outings, workplace game rooms and fitness centers…the list goes on and on. While these approaches can help, they cannot mask the anti-retention forces found in the poor hiring, onboarding, and management practices institutionalized in far too many organizations. With all this in mind, let’s consider nine highly effective retention strategies that any organization can use. Re-design and optimize your hiring process and practices for 2019-2020. This begins with understanding what emerging technologies are available to help you and auditing every aspect of the way your organization attracts talent, evaluates it, and hires that talent. Simply using outdated methods places you at both a competitive disadvantage and often results in making it more difficult and costly to hire. Consider an independent audit of your hiring practices. Implement the right assessment technology to select for job fit. You rarely know if you’ve hired the right person until the new hire completes six months on the job. Most employers hire based on perceptions gained during the interview phase. In contrast, best-practices employers utilize a battery of assessments keyed to the position to assure excellent matching between candidates and the specific job. Key question: would you rather spend a few hundred dollars in assessment costs on making the RIGHT hire, or several tens of thousands of dollars and losing six months’ time to realize you made the wrong hire? Consider consulting with professionals who can help you select the right assessment tools for your organization’s specific need. Re-design and optimize your organization’s onboarding process. There’s a high correlation between people that were ineffectively onboarded and excessive turnover. A good onboarding program lasts about six months, and pays for itself by cutting one third off the time it takes to get a new hire to full productivity. Almost every person I’ve interviewed who has quit a job cites at least one onboarding failure that has negatively affected them during their entire employment with that employer. Consider an independent audit of your onboarding program. Employee engagement studies such as the ones I’ve conducted over the past two decades usually reveal significant oversights in some of the most essential processes used to manage, focus and develop the talented people employers want most to retain. Any and all of the following suggested solutions can improve your organization’s employee engagement, productivity, and retention. Select your managers carefully. Stop and think about this fact: 95% of your organization’s assets and 95% of your organization’s people are supervised by your organization’s first and second-level managers, who make decisions about your organization’s assets and people. Yet historically this group receives the least amount of training and development. A common organizational practice is to promote a successful individual performer to a supervisory role based on that individual’s track record, which while important, does not predict how well suited for supervisory responsibilities that individual is. Best practice organizations use assessments (such as leadership competency, behavioral, driving forces, and EQ) as part of their well thought out management-selection process. Consider an independent audit of the way your organization promotes people. Implement continuous development programs for all managers. As stated in the previous point, new managers need an L&D track (learning and development) that assures each manager learns and masters the key disciplines he or she needs in order to be effective. Gallup found that half of all US adults have quit at least one job to get away from their manager. Conversely, managers who have been properly trained have consistently greater levels of employee engagement and retention than do their less-trained counterparts. My engagement studies show that employees have zero problem identifying the supervisors who practice effective management and supervision and those who do not. Moreover, their intent to remain with their employer is directly proportional to their supervisor’s management competence. Consider an independent audit of your manager’s management competence. Assure all leaders are highly effective in the key managerial competencies. Some managerial competencies are more critical to employee retention than others. Some of the most impactful employee retention competencies include: setting expectations; giving and receiving feedback; coaching (not giving advice); creating a motivational climate; holding effective one-on-one meetings; career development discussion planning with employees; and behavioral-based management (managing to the individual and not treating all staffers the same). Depending on your organization’s specific needs, other competencies may be similarly important. Again, audit to determine the most important competencies your organization need, then develop and implement an L&D program to assure high levels of competence in these areas. Implement a continuous employee learning & development (L&D) program. One of the primary reasons why turnover is so high for Millennial and Gen Z employees is due to their strongly-held belief that their future success is tied to learning and acquiring skills and competencies as quickly as possible. That said, once they have learned what their current employer offers, Millennials and Zs tend to change employers in order to learn new things. Best-practices employers promote a culture of continuous learning and development relevant to the employee and his/her job, and in a way that it is immediately applicable to the employee’s work. Employers are learning that such a tailored training approach is valued significantly more by employees than access to vast libraries of high-quality but generic Tuition reimbursement and external coaching are other tools to help continuous learning. Consider auditing your own organization’s approach to this. Assure work/life balance is maintained. One of the most important retention drivers with both Millennials and Gen Z is an employee’s sense of work/life balance. A key to helping employees maintain that balance may be found in flexible working arrangements. Assuming that the nature of the work will allow it, work from home days and flexible scheduling are two approaches valued by employees. Schedule flexibility can come in a variety of forms, such as four 10-hour days in lieu of five 8-hour days during the summer, working an afternoon-evening shift instead of a traditional morning-afternoon shift, or even swapping a weekday for a weekend day. Further engage employees by asking them to identify and propose flexible working arrangements they would like to see. In all cases, insist that flexible work arrangements are a reward for those who can maintain high performance standards. The preceding nine retention solutions are just a start. As was suggested in the last solution, engage the entire team in helping to identify the impediments to employee engagement, and engage them in becoming part of the solution by developing the solutions! Anyone interested in learning more about the findings from our employee engagement studies or my recommended engagement-raising strategies to mitigate turnover should contact me via email at hank@boyermanagement.com. Let’s continue the conversation!